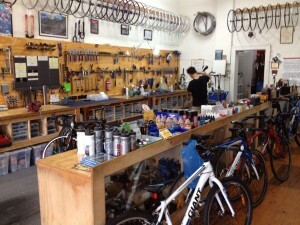 Quality Bicycle Repairs is located at 112 Union Road, Surrey Hills, approximately 12 km east of Melbourne. We specialize in repairing and servicing all types of bicycles: road, mountain, cyclocross, hybrid, commuter, touring and children's bikes. Whether you commute, race, hit the trails, or just ride with the family on Sundays, Quality Bicycle Repairs is equipped to keep your bike running properly. We take pride in our attention to detail, and we will explain in simple terms what work is required and what it will cost. We can supply any parts your bike needs, or we can fit parts you have obtained elsewhere (with a smile!). Our specialty is service and repairs to all sorts of bicycles - road, mountain, cyclocross, hybrids, flatbars and singlespeeds. While a standard service is $75, we will assess your bike when you bring it in and try to identify any areas that may require particular attention. We're familiar with Shimano, SRAM and Campagnolo systems, including Di2, eTAP and EPS electronic shifting systems, and we're constantly gaining experience dealing with creaking bottom brackets! We handle most suspension fork and shock servicing in-house and can advise on correct set-up and adjustment. Likewise, suspension linkages, hydraulic disc brakes and downhill setups are all well catered for in our workshop. Most repairs and servicing can be carried out within 5 working days. We will call you if your bike requires additional work, and we will call when your bike is ready to go, or if there is a delay. All bikes are thoroughly tested before handover to ensure everything is working properly for you. Please call on 03 9830 4956, send an email or drop in to the workshop! Need a bike assembled or on-line parts fitted - Quality Bicycle Repairs can help!